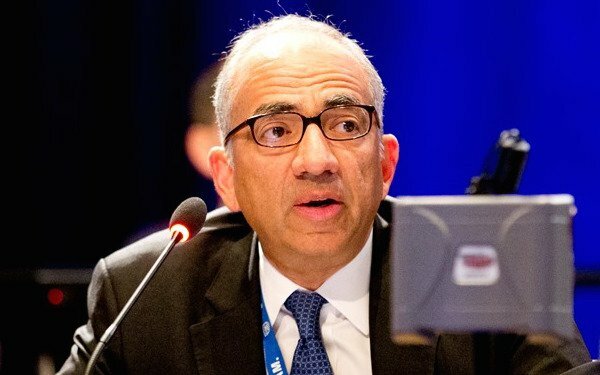 Carlos Cordeiro, the U.S. Soccer vice president since 2016, was elected the next U.S. Soccer president, winning on the third ballot. Cordeiro, who was born in India of Goan and Colombian presidents, moved to Miami as a teenager. He retired as a Goldman Sachs executive in 2001 and became the first independent director of U.S. Soccer in 2006. He served as treasurer starting in 2008 and was elected as U.S. Soccer vice president in 2016. Many knew Cordeiro as outgoing president Sunil Gulati's adviser and confidant. That experience gave him wide knowledge of the workings of the federation and its role in the international game, as well as a chance of know much of the membership. Cordeiro led Kathy Carter narrowly after the first round but his support grew in the second round to over eight percentage points. Much of Carter's support -- including the Pro support -- moved to Cordeiro in the third round. Cordero was the only candidate who had run for a federation position before and his surprisingly easy win over incumbent vice president Mike Edwards and longtime soccer executive Kevin Payne showed his connection to the membership. "Thank you to those of you who have supported me today," Cordeiro said from the podium. "This is incredibly humbling. I want to thank all the candidates for a stirring campaign. I'd like to thank Sunil and our board for their tireless service. To those of you who didn't vote for me, I'm going to work to earn your support and trust over the next four years. I promise I will work for all of you to bring us together as one soccer community. Thank you very much." 21 comments about "U.S. Soccer: Carlos Cordeiro is elected president on the third ballot". Nick Gabris, February 10, 2018 at 12:09 p.m.
R2 Dad, February 10, 2018 at 12:22 p.m.
We're doooooooomed. The lemmings won. Ben Myers, February 10, 2018 at 12:25 p.m. Here's hoping that Cordiero recognizes the need for much needed changes from top to bottom. One can only hope. I must say I am less than comfortable with a numbers guy who has little on-the-field experience. Wallace Wade, February 10, 2018 at 12:26 p.m.
It’s all about $! Send these pathetic people a message! Close your wallets! When the $ starts to go away, we will get change in this country! j bapper, February 10, 2018 at 12:32 p.m. The Good Ol’ Boy Network of US Soccer wins again. Got to take care of your friends. R2 Dad, February 10, 2018 at 1:06 p.m.
"Thank you Sunil, for introducing me to the game 10 or 11 years ago....." We Are Dooooooooomed. Right Winger, February 10, 2018 at 1:19 p.m.
Everyone makes mistakes. Many learn from the mistakes they make. Not US Soccer. This is a RUBBER STAMP. PERIOD. WHEN THE TWO FRONT RUNNERS ARE INSIDERS YOU HAVE A PROBLEM. Go to this site: theplayerstribune.com. Read the article by Geoff Cameron. " What must change in US SOCCER. frank schoon replied, February 12, 2018 at 3:35 p.m.
RW, that was a good article by Cameron and ofcourse he's right. Klinsman brought a real sense of what soccer is all about. And I better understand the conflict he had with Landon Donovan, for he missed that extra... Bruce Arena has never played at the highest level and therefore missed what is needed to improve and raise players to a higher level, unlike Klinsman. There is a schasm between players playing for the MLS and those going to Europe. But Klinsman is right...if you're good enough to go Europe don't waste your time in the MLS. But unfortunately that is not the only problem the US is facing. Bob Ashpole replied, February 12, 2018 at 3:56 p.m.
Cameron was clearly talking about the most talented young players, 18 to 24, playing in Europe instead of MLS, not everyone. On the other hand Klinsmann publically criticized everyone in MLS, including players returning from Europe to MLS toward the end of their career. Big difference. frank schoon replied, February 12, 2018 at 4:49 p.m.
Bob, having read Cameron's article our players needed criticism as well as the one's that returned from Europe, especially those who came back who thought perhaps they were beyond criticism. Klinsman has played at the highest and those types of players you simply can't fool and for they know what is needed at hand. Bob Ashpole replied, February 12, 2018 at 10:52 p.m.
Frank, I think you are selling Donovan short if you doubt his need to win, but that isn't what this cycle was about. Criticizing last year's team for lacking the necessary drive to win is, with individual exceptions, correct. I used to call the drive a "hunger." Today I will call it the "entitlement" mindset. Entitlement meaning the thought that, if I just show up, good things will happen because I have talent. That is why parents and coaches should praise effort, not talent, to avoid encouraging an "entitlement" attitude. Complacency is another apporpriate word. This entitlement attitude is not something new. It was around during my generation. A number of high school stars would go to college scholarships and then loose them because they didn't have the desire to improve. They thought they were special until they got to college and everybody was special. The weak willed gave up. In that last match, I saw only a couple of players playing with any urgency, even when behind. After the half break, there was some urgency initially, but it quickly evaporated after the US scored. Back to only a couple of players playing with urgency. Although it is the coaches responsibility, it is bit harsh to fault the coach for the player's conduct. Responsiblity and fault are two different concepts. Bob Ashpole, February 10, 2018 at 1:21 p.m.
Congratulations to Carlos Cordeiro. He will be a fine USSF president. No surprise. I expect Carter will continue at SUM. No one else is going to be replaced for appearances sake. I look forward to seeing what happens next. Who will he support for VP? He might even reach out to some of the other candidates. Kent James, February 10, 2018 at 6:09 p.m.
R2 Dad, February 10, 2018 at 6:10 p.m.
Don Garber: "One of the good guys won". So all that talk of unification is just a big circle jerk. Arthur Judge, February 10, 2018 at 6:11 p.m. I am not an expert, but I am saddened. We needed fresh air and thus does not do it. Sadly I expect we will just get more mediocrity. Mike Fredsell, February 11, 2018 at 12:21 p.m.
Well things will not change! I don't care what this guy says things will be the same. This contry needs a national methodology that every club and academy has to go by. The youth in this country are taught so many different ways of playing this game that we can never compete with the big 3. Very dissapointed. frank schoon, February 12, 2018 at 11:49 a.m.
Guys, I have a bitter taste about this whole process. I'm not going to bad mouth Mr. Cordeiro for he might be a great candidate...who knows. But I'm a simple guy and I try to look at soccer problems in a very direct and simple way. First of all, our WC disqualification, is due to our poor on field performance which consequentially initiated a feeling of a needed big"CHANGE". In other words we need someone in leadership who understands this situation. I did not see ANY of the candidates bring this 'on the field ,training , coaching and player development" problem up. Unfortunately ,I think ,instead,we'll continue to develop 'lap coaches', bring in Dutch coaches, flunkies from the KNVB who have contributed nothing to the game of soccer who themselves lack high level playing experience . In other words , no change in the area of soccer that needs the biggest change of all in order for us play better. With this backround, we have voted in a #2, inside guy, who has never even played the game, probable incapable of trapping a 25 lb. bag of cement ,but still he might be the right the guy...who knows... It seems like, to me, the leadership which has contributed to what our problems are on the field has not changed, other than a changing of chairs. Next, I like to find out what was offered, the pay, the emolument for this bloc vote that got Cordeiro to the forefront. frank schoon replied, February 12, 2018 at 11:52 a.m.
Bob Ashpole replied, February 12, 2018 at 3:52 p.m. It is only the first work day after the election, but I am worried already. It appears that the "change" USSF has in mind for the soccer side is to switch control from the president to the CEO and appoint to middle managers between the CEO and the WNT and MNT coaches. In other words a bureaucrat's solution to a practical problem. Having a bunch of people looking over your sholder never made changing a flat tire any easier. Recently Geoff Cameron wrote an interesting opinion piece at another website. @Soccer America please either interview him or invite him to contribute an opinion piece. frank schoon replied, February 12, 2018 at 4:56 p.m.
beautiful game, February 12, 2018 at 3:14 p.m.
That's what the USSF needs, a former Gold$acks executive, now head an organization that has been dysfunctional for decades. Get ready for another meltdown. What is needed is reinvention of the USSF with a futuristic outlook.